RED RANSOM (USA) (1987). 2 wins at 2 in USA. Sire of 1610 rnrs, 1086 wnrs, 110 SW, inc. Electrocutionist (York International S., Gr.1), Typhoon Tracy, Perfect Sting, Red Clubs, etc. Sire of the dams of SW Homesman, Ransom the Moon, Secret Agenda, War Command, Rollout the Carpet, Temida, Devil May Care, Mahbooba, Red Ruler, Eyjur, Ringerdingding, Alassio, Fursa, Deploy, Ghisoni, Ivawood, Daring Dancer, Vavasour, Ovidio, Vilanova, Vo Heart, etc. TORUMBA (c. by Marscay). 5 wins to 1400m, A$198,830, VATC Mercedes Benz S., L, Christmas H., L, Gold Coast Summer Racing Carnival H., SAJC Dollar Day H., 3d VATC Robert Hunter H., SAJC Pope H.
Crimson Abbey (f. by Red Ransom). 2 wins. See below. Depends (g. by Octagonal). Winner at 1600m in Aust. Eye on You. 3 wins at 1100m, 1200m, BRC Yellowglen H., 2d HKJC Yuen Chau Tsai H.
RON'S CALL (Magic Albert). 7 wins to 1400m, A$291,675, WATC Fairetha S., L, Westspeed 3YO H.-twice, Crown Perth Sprint H., Fleet West H., G1X.com.au Sprint H., 2d WATC Schweppes Derby Day Raceday H., Super Saturday H., Malt Supper Club H., 3d WATC Birthday S., L, Jackson's Restaurant H.
Simon's Call - Adoration (H.K.). 4 wins to 1400m, A$8,775, HK$3,436,750 in Aust. and HK, HKJC BMW Performance Race H., William's Coach H., Kestrel H., 2d HKJC Hong Kong Racehorse Owners H.
Soaring Dragon. 4 wins from 1600m to 1800m, MRC Nuffield H.
Kooroora Miss. 2 wins at 1400m, 1600m in Aust. Punto Nero. Winner at 1400m in 2018-19 in Aust. Casino Blue. Winner at 1600m in Aust. Vacqueyras. 5 wins from 1200m to 1600m, A$93,704, 2d WATC Country Interstate Members H., PR Midweek Roast Package H., 3d WATC Melbourne Cup Tour Dinner H.
NASHVILLE (Darci Brahma). 15 wins from 1200m to 2100m, NZ$995,637, A$500, to 2017-18, Otaki Maori RC WFA S., Gr.1-twice, 2d Hawkes Bay Spring Classic, Gr.1, Waikato RC Herbie Dyke S., Gr.1, WRC Captain Cook S., Gr.1. VINNIE EAGLE - MASSIVE MILLENNIUM (H.K.) (I Am Invincible). 6 wins-2 at 2-at 900m, 1200m, NZ$78,745, HK$1,963,200, to 2018-19, ARC Eclipse S., Gr.3, Waikato RC Waikato Farmers Markets H., HKJC Lam Tin H., 2d Waikato RC James & Annie Sarten Memorial S., Gr.3. WHITLAM (Elusive Quality). 6 wins-1 at 2-to 1200m, A$370,665, SAJC City of Marion S., L, Drink Driving? Grow Up H., 2d SAJC Spring S., Gr.3, Oakbank S., L.
ETYMOLOGY (New Approach). 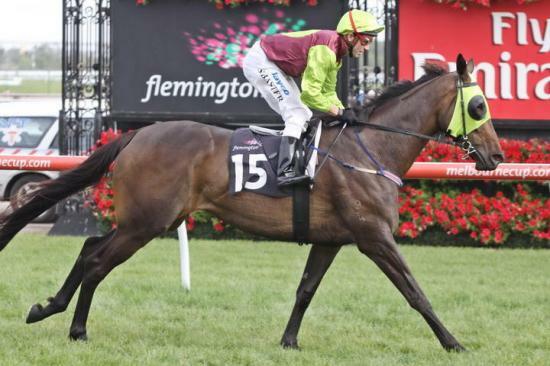 5 wins from 1400m to 2800m, A$894,735, to 2018-19, VRC Bagot H., L, 2d Victoria Derby, Gr.1, South Australian Derby, Gr.1, 3d MRC Caulfield Classic, Gr.3. TRUDEAU (Exceed and Excel). 12 wins-2 at 2-from 1200m to 2000m, A$41,770, 449,275Rgt., S$698,016, to 2018 in Aust., Malaysia and Singapore, Selangor TC Piala Emas Sultan Selangor, L, Singapore TC Garden City Trophy, L, EW Barker Trophy, L, 2d Singapore TC Polytrack Mile Championship, L.
2 wins at 1700m, 2000m in Aust. 2011 g. Royal Abbey, by Bon Hoffa. 3 wins from 1200m to 2200m, A$80,335, to 2018-19 in Aust. 2014 f. Velvet Dancer, by Hard Spun. Unraced. 2015 f. Crimson Ace, by Skilled. Raced once. 2016 foal by Bon Hoffa. Dead. Served by Bon Aurum. Date of last service, 07.11.2018.